Ranch Lite is the second iteration of Hufft Projects’ renovation of a mid-century Ranch style house. Much like its predecessor, Modern with Ranch, Ranch Lite makes strong moves to open up and liberate a once compartmentalized interior. The clients had an interest in central space in the home where all the functions could intermix. This was accomplished by demolishing the walls which created the once formal family room, living room, and kitchen. The result is an expansive and colorful interior. As a focal point, a continuous band of custom casework anchors the center of the space. It serves to function as a bar, it houses kitchen cabinets, various storage needs and contains the living space’s entertainment center. Which colors were used in the Flor design? How much are the stools? Where can I find it? These stools are perfect! Thanks so much for the resource! Great website and fantastic design! Aerial countertop section length and support - Planning on doing something similar in my kitchen where the extra long island will has space for 6 stools, 3 on each side, just like that section in your photo. I plan to use caesarstone, siltstone or something of that nature. What countertop material did you use? What is the length of the aerial portion above the stools? What type of support did you provide underneath? Is the right end leg made of the same countertop material serving as end support for the countertop or is there additional support behind that side end? Thank you very much. Cabinetry - I love the lightness of the cabinetry married with the material of the bar area. Please tell me what type of wood and stain you used? Also, what is bar material? Well done! How would you attach the bar perpendicular to a wall end? - We are removing part of the wall between our kitchen and living room. We really like the open breakfast bar here. We would have about 8-10 inches of wall to connect it to. This room has so much good energy. The Onda stools look like modern chess pieces atop this colorful checkerboard area rug. 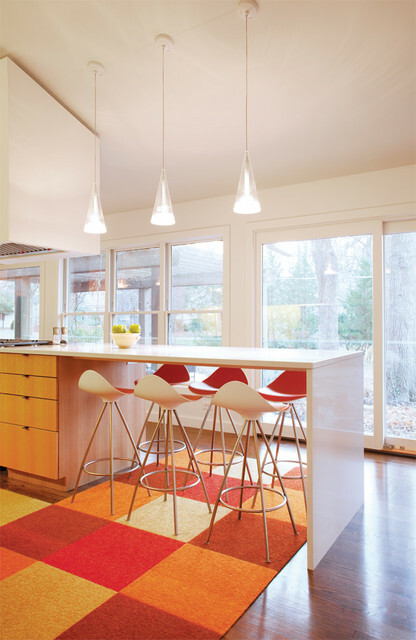 Recognize those pendant lights? Read more about them here. Blank Canvas With Bold AccessoriesHere's another kitchen that smartly features bold colors in a way that's easy and relatively affordable to change at any time. You could give this kitchen a completely different look just by swapping out the carpet tiles and counter stools. Extending this countertop serves a dual purpose: It opens plenty of space to tuck in stools, and it also expands the work area when no one's eating.